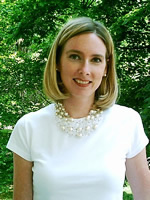 Michelle Disler is an assistant professor of creative writing at Ohio Wesleyan University. Her work has appeared in The Laurel Review, Seneca Review, Lake Effect, Gulf Coast, Painted Bride Quarterly, Witness, Southern Humanities Review, North Dakota Review, Fugue, Hotel Amerika, Fact-Simile, and Columbia, from which she received the Essay Prize. Monkeybicycle: Though perhaps an obvious beginning, I can’t help but start here: How many of the Bond books have you read, and how many of the Bond films have you seen? Michelle Disler: I’ve read them all, and I’ve seen them all, and all of them more times than I should probably admit. Bad day? Watch a Bond Film. Bad hair day? Watch a Bond Film. Bad date? Well, Bond is always a good stand-in, especially then. My favorite novels are Casino Royale, From Russia With Love, and Dr. No, and my favorite movies Casino Royale, Dr. No, For Your Eyes Only, Goldfinger, and Skyfall, and my favorite Bond(s) Daniel Craig and Sean Connery. Mb: Where did this project start? Why a book on James Bond? MD: I have watched 007 movies with my dad for years, and with my mom, who saw them in theaters with my dad when they were dating in the late ‘60s, and when I began my graduate studies, I encountered the novels in literary theory classes with Dr. Robert Miklitsch. I should also mention that like Bond in the novels, my dad is a detective, and as I started to get to know the novel Bond, I also started thinking more about my dad and his career and the effects his career had on my family. He worked long hours, juggled multiple homicide investigations, worked on autopsies—I joke my interest in Bond must be genetic. I had written a few failed essays on Bond and Bond Girls for graduate workshops in my doctoral program, when I hit upon the idea of Approximate Number of Times, which also came about as I was reading and re-reading the novels, and teaching them in a special topics composition class at Ohio University. I was also reading MFK Fisher’s An Alphabet for Gourmets and Gertrude Stein’s classic Tender Buttons, and I started to see new poetic possibilities for writing a deconstructive social commentary on the Bond in the novels, who’s a bit different from the Bond on the silver screen. This was also my dissertation year, so the Bond Alphabet and Anatomy became a part of my creative dissertation in nonfiction. Mb: Part of the reason I adored this book is its generous play with structure. [Bond, James] uncovers the cultural moment (or movement) of James Bond using indices, multiple choice and fill-in-the-blank tests, faux math formulas, varying lists, and a smattering of poetic forms. How did you decide which forms to use and where to insert them in the final version of the manuscript? Were there any forms that never made it into the book? MD: I had a great time with this formal play, which was very intuitive, very organic for me. I love Georges Perec and Oulipo, and am very influenced by the group’s use of formal constraints to produce creative texts, and I was writing Bond under the Oulipo influence. I confess to also having paged through an undergraduate Spanish language textbook filled with language drills looking for ever more ways to flog Bond by language play through a quiz or a short answer question designed to examine within an inch of his literary life. And when I showed my dad (who is very science and math-minded) the faux math formula used in “S — Sum,” I believe his response was, “You can’t do that.” We did have a good laugh together that one, especially when I said it was the first time I had really ever had a good time with math, and I thought he would be happy about that. “No,” he said, smiling. I think he still shakes his head over that one. And we still laugh about it. “It’s art, Dad,” I say, and he still laughs. As for any omissions, I think I really went to the mat on this book: I think much of what is in the book is what emerged as I was writing the Bond material in my dissertation year. The topics for the letters of the alphabet changed as I moved back and forth through the alphabet (I didn’t start with A and move methodically toward Z), but the forms emerged with the subject matter of each letter or each anatomical aspect of Bond, the forms and subject matter really working in tandem to produce really pleasurable and unexpected results. Mb: This book leads with a dedication to your dad. Can you talk a little about this? MD: I think I was very surprised by just how human Fleming’s Bond really is, and reading the novels challenged me to see my dad, also a detective, in a similar vein. They are both such mythic and heroic figures to my way of thinking, and both entitled to moments of heroism and humanity, both very hard-working and challenged by circumstance, and both with moments of intense feeling combined with a grim but lively sense of humor: I don’t remember the first Bond movie my dad and I saw together, but we usually watch one when we get together. I like to say my dad and Bond have a few things in common: the world is their office, they’ve both had their share of martinis, and they’ve both wrecked company cars in high-speed chases; Bond is a way for me to connect with my dad on shared intellectual and emotional ground. Mb: What is the next project you are working on, and will it have a similar investigation of structure, or will it follow a different path? MD: I am having great fun with formal play, and with testing the flexibility of the essay, itself a flexible form, and I am working on two writing projects, one which will be a book of prose poems, usually exploring gender roles (as I do in Bond and in other creative works), and the other which will be an accounting of Beaver Island, Michigan, where my dad has built a house, and where a 19th century convert to the Mormon faith crowned himself king of his followers there. I’m not sure what shape the Island book will take, though I am thinking of a series of letters or lyric essays or a combination of the two. 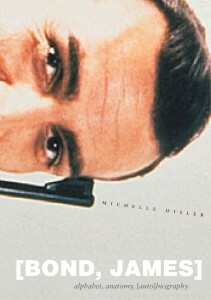 Purchase a copy of [Bond, James] here, & read more from / about Michelle Disler here. J. A. Tyler is the author of nine novel(la)s of poetic fiction. His work has been published in Black Warrior Review, Redivider, Cream City Review, Diagram, Fairy Tale Review, Columbia Poetry Review, and New York Tyrant.